Happy Construction Monday…..we’re going to go behind the walls and floors to check out the plumbing system that Everett Custom Homes installs in these energy-efficient homes. 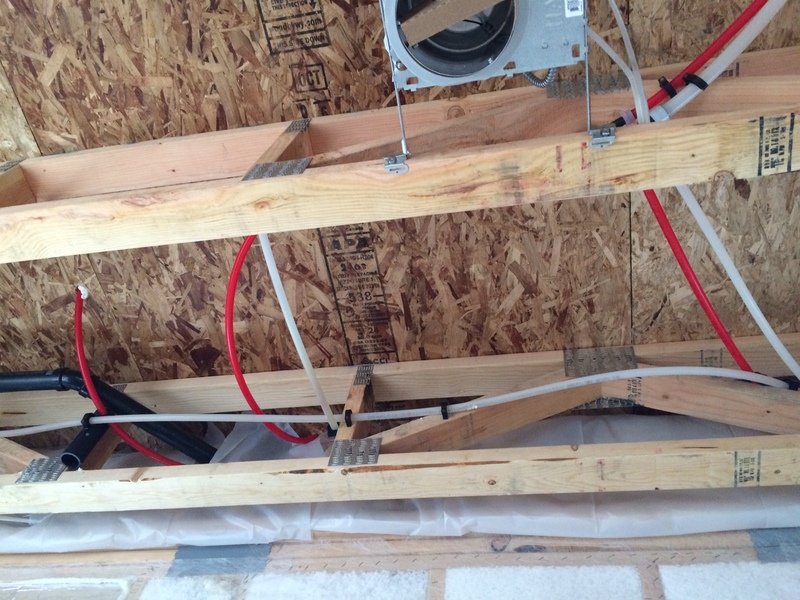 You may not be aware, but PEX (crosslinked polyethylene) plumbing systems are installed more often in new homes because it is more durable, reliable, and a cleaner option than copper and CPVC pipe systems combined. What is PEX, you ask? This crosslinked polyethylene tubing is a flexible, durable, proven piping product that has been used in plumbing systems for more than 20 years. PEX tubing won’t pit, scale or corrode and, because of its flexibility, it also offers potential freeze-damage protection. PEX plumbing systems offer a clean, safe, and healthy system for transporting water. These systems do not use torches, glues, chemicals or solvents like traditional copper and CPVC systems, and provides another win for the environment — keeping dangerous chemicals out of our plumbing systems and groundwater. This plumbing system also meets national lead-free legislation and exceeds the U.S. Safe Drinking Water Act. The next time you use the faucet in an Everett Custom Home, you’ll have piece of mind in knowing that this plumbing system offers so many great benefits and a better alternative for the environment.